An apartment in St. Petersburg and a country house in Arkhangelsk region where Joseph Brodsky lived are being prepared to host a display of the poet’s belongings, photos and media materials. Both museums are scheduled to open in 2015, the year Brodsky would have turned 75. Final preparations are underway to turn the St. Petersburg apartment where Joseph Brodsky lived with his parents before leaving the USSR and the country house in Norenskaya village, Arkhangelsk region, where he spent 18 months of his internal exile, into house museums. This public-funded project will be completed in time for Russia’s Year of Literature, which will take place in 2015. For almost 15 years, the Joseph Brodsky Museum Foundation in St. Petersburg has been working to turn the communal apartment at 24 Liteyny Avenue into a house museum dedicated to the poet. Brodsky’s family occupied two of six rooms, and he described their time there in his essays “A Room and a Half” and “Less Than One.” On June 4, 1972, the poet left this apartment and headed for Pulkovo airport to leave the USSR for good. Mikhail Milchik, the president of the foundation and a friend of Brodsky’s, was among those who visited the apartment that day. “On June 4, when we were seeing Joseph off, I asked Mariya Moiseevna (Brodsky’s mother) not to touch anything in the room, and she complied with my request,” said Milchik in an interview to Izvestia newspaper. In the late 1990s, after Brodsky’s death, a group of prominent cultural figures that included the director of the State Hermitage Museum, scholars, writers, composers, and the Nobel Prize laureates and Brodsky’s personal friends Cheslav Milosh and Derek Walcott petitioned the then-governor of St. Petersburg, Vladimir Yakovlev, to create a Joseph Brodsky museum. The governor was in favor of the idea, but there were no state funds available to buy the apartment from its present tenants. In 1999, the foundation was established, which set in motion the first Russian project to create a public-funded museum. After contributions from numerous businessmen and companies, the opening day is within sight: the museum is set to open on May 24, 2015, the day Brodsky would have turned 75. However, the apartment still retains one tenant – a retired woman who has been living there since childhood. Although the city administration has offered to move her at its expense to a choice of five different apartments in the center of St. Petersburg, she is still unwilling to leave. Negotiations are ongoing. “Brodsky’s apartment is fully preserved as it was during his life here,” says Milchik in an interview to RIA news agency. “The kitchen is completely the same – even the old wood stove is there, though nobody uses it.” However, restoration work is still required, which begins this July. According to Milchik, the museum will display the poet’s personal belongings, letters and archive photos. 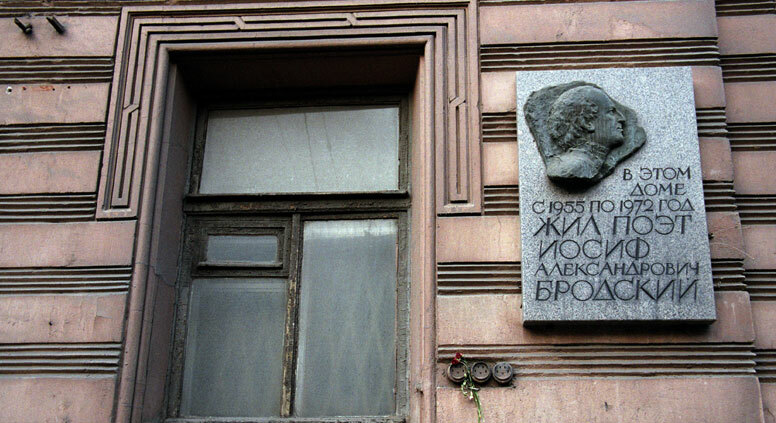 The rest of the apartment will contain an exhibition dedicated to Brodsky’s era – the museum will show how the poet and his contemporaries lived in 1970s Leningrad. Poetic readings, thematic exhibitions and movie screenings will also be held in the apartment, which will become a cultural center for Brodsky enthusiasts. Another place in Russia that is inseparably connected to Brodsky is the village of Norenskaya, Konoshsky district, Arkhangelsk region, where the poet spent 18 months of his internal exile in 1964-1965, after being charged with social parasitism for not having a day job. Brodsky called this time one of the best periods in his life. Despite the uncertainty of his fate and a longing for home, he worked prolifically – both creatively and physically – read a great deal and mingled with the locals. Scholars are unanimous in the belief that this period of exile greatly influenced Brodsky’s poetic vision, so it is fitting that the country house he rented in Norenskaya will be given the same status as the St. Petersburg apartment. Norenskaya is now an abandoned village, but locals cherish the memory of Brodsky’s period in the countryside. In 2004, the Konoshsky district central library became the first in the world to be named after Brodsky; an annual literary festival named in his honor has been taking place there since 2011, and in 2013 a movie dedicated to Brodsky’s time in exile was filmed by local journalists and museum workers. All these initiatives have received active financial and informational support from the local authorities. In 2013, the government of Arkhangelsk region purchased the poet’s old house to restore it and establish a house museum. Luckily the house is still intact, although it needs significant work doing on it. The restoration, which started recently, is being carried out with the support of the governor of Arkhangelsk region, Igor Orlov. The restoration project was created with the help of Mikhail Milchik’s restoration company and the Joseph Brodsky Museum Foundation, which attracted considerable funds from private sponsors. Joseph Brodsky’s “American cabinet” is a part of display in the Anna Akhmatova Literary and Memorial Museum in the “Fountain House” in St. Petersburg. In 2003, the poet’s widow Maria Brodsky and the Estate of Joseph Brodsky donated some of the poet’s personal belongings from his home in South Hadley, Massachusetts to the Fountain House. Items included his desk, reading lamp, armchair, books and posters. Although the poet’s cabinet has not been reconstructed exactly as it was in South Hadley, the display has been extremely popular among visitors, as it has been the only permanent exhibition devoted to the poet in Russia. Maria Brodsky recently decided to present more of the poet’s personal effects to the museum: furniture and bookshelves from the American apartment where Brodsky lived with Maria and their daughter Ann for the last three years of his life. According to Nina Popova, the director of the Anna Akhmatova Museum, the “American cabinet” exhibition will remain in place after the poet’s new house museum opens. Combined report, based on materials from RIA Novosti, Izvestia.ru, NEWSRU.com, Promorland Travel.